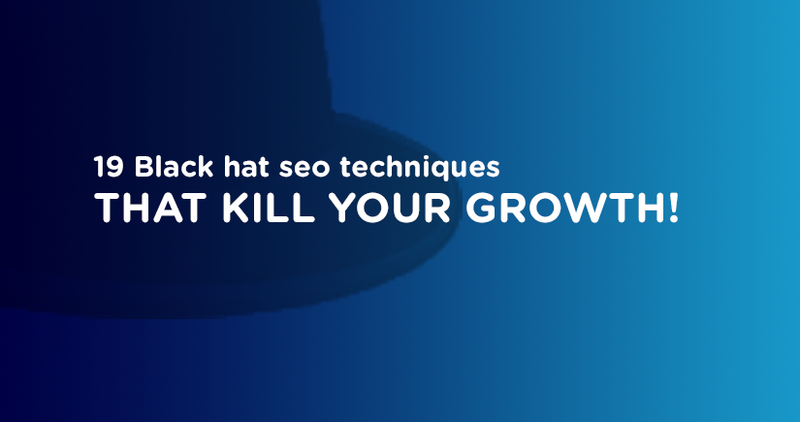 19 Black hat seo techniques that kill your growth! As a startup what you dream? We all want success and want it bad! Startups want to rise quickly, and there was a time when black hat SEO could swiftly do the job for you. The search engines have been hunting down black hat SEO techniques with no remorse. So applying black hat SEO techniques to grow will eventually make things worse. In this post, I will explain 19 of those cunning black hat SEO techniques which may look harmless in the naked eye but can end your startup right when you are growing! Free PDF Download: Get access to the free checklist that will show you the core black hat SEO techniques you must avoid. What it is: Cloaking is one of the most commonly used black hat SEO techniques to earn traffic through deception. Cloaking allows you to provide entirely different content or URL to the visitor than to the search engine spider. Google deploys bots to scan your website and validate the information you provide there for indexing. You will be considered doing “Cloaking” when you display two different pages to the search engine spider and the visitor who would click the link from the SERPs. Business widely used this SEO technique that can absorb a lot of visitors. If you recall, while browsing for movies, music or free anti-viruses you may have landed on a page which had nothing to do with your search result. It is sort of “Cloaking” that leads to massive traffic to that site. How it hampers: It is no less than decapitation. You are sending a lot of traffic from particular pages, and suddenly you may find your entire domain has been de-indexed and penalized big time! Google is serious about doorway pages, and it came on the webmaster blog on March 16, 2015. So please read this before even planning to use doorway pages! There is an exciting read on Moz about how a site was penalized and what Google said. You can check it here. It was one of the most favorite black hate techniques for spammers. Googles thoughts: Google explained it very well on their support page. Moreover, the uselessness of this black hat technique has been described by Matt Cutts on his blog here. Google hates this technique as this does nothing good for the valuable visitors. What it is: Link building is a vital ranking factor on the search engine. This process is not straight and requires a lot of hard work, efforts, and quality. Paid links can make it easy for the site owners. First, the site owner doesn’t have to bother about content quality, can put the desired anchor text and even link up with the desired content. These are enough resources to influence the rankings in an unsolicited way. Therefore, it is considered as one of the most used black hat SEO techniques at present. If Google can detect this, the consequences could be severe. De-indexing, lowering the page rank, and pushing back to the search results and eventually cutting your overall traffic to half! What it is: It is one of the most annoying black hat SEO techniques around. You put illegible text and links at the bottom of any page or in other corners where the texts or links are visually untraceable. You set the same color as the background over the text or links. Thus, you can stuff keywords which visitors don’t want to see. How it hampers: Search engines don’t like anything hidden. It is because your hidden content may be opposite to your objective and entirely placed for personal gain. Anything that goes against the user’s interest is objectionable. Therefore, Google has explained its guidelines and consequences here. What it is: Well, this is merely stealing or theft or whatever you call! You copy others writing and put it on your site or on any page with keywords and may think nothing will happen. It doesn’t have to be a complete match but could be closely similar. How it hampers: Duplicate contents are not always a black hat. It depends on how you do it. For example, you can copy a part of a blog, a piece of content, quotation or any other information that can add value to the users. It’s not considered as spam by Google. But if it’s abused and done in a manipulated way Google has the right to prevent that. For example, you are copying information but not mentioned the source is a manipulation. It will hamper your ranking and reputation. What it is: It’s merely re-writing an already published content manually or by using bots. It is an everyday job for lazy marketers who don’t want to work hard enough. They copy, spin it and publish it. If you search for “content spinning tools” online, you will find a lot of free tools by which you can do it quickly. How it hampers: First thing what gets hampered here is the quality of your site’s content. Spun articles are made of weird words and phrases as bots process them. As a result, the contents are not readable to human visitors. Article spinning is done mainly for cloaking! You can cheat the Google spider by showing different content to them and a different one to the users. Once you are caught, you face the wrath of the search engines. What it is: It is one of the eldest and repeated black hat SEO techniques in the SEO industry right now. Keyword stuffing is a process by which you overload your keywords in your site content. You align the keywords unnecessarily with the Meta tags or throughout your site content. How it hampers: It reduces your conversion as people don’t like stuffing in anything! It also will cause you less social shares due to the low quality of your contents. Moreover, the search engine penalties will be around the corner as well. So it’s an absolute suicide to stuff keywords in your web pages only to rank high for a small period. A spam blog is made for the sole purpose of link backs to associate sites and not to have any value to the users. It’s one of the most difficult black hat SEO techniques that annoys the users and spoils the beauty of blogging. How it hampers: In every possible way, it makes your SEO effort a complete waste! Whatever traffic you are generating from spam blogs can only sustain for a small duration. Soon, your root domain and associated sites all will be put down or de-indexed once the Google spider tracks spam blog elements. So it’s a no-win situation and complete waste of time and money. While I was checking the traffic sources of my blog, I found these three links from where we got some visitors. But the activities were 0! It is an example of referrer spamming! How it hampers: Well, it may get you some early traffic due to misleading texts and repeated attempts, but in the end, you will end up with nothing. If you try to visit any of the sites above mentioned on the image, you will find them unavailable. That is because Google has taken them out. What it is: It’s a group of authority sites which could of many numbers that link your money site with high-quality anchor texts. The deceptive part of it is you have control over the network and regardless of how horrible your content is you can link it up with catchy anchor text. Thus, it improves you ranking dramatically and quickly. How it hampers: PBN was a viable way to rank sites for black hatters even last year! But according to Barry Schwartz Google is all set to target PBNs with manual action and penalties. There is a great read about it on search engine land here. What it is: changing a page already indexed, ranked and popular with traffic and making it completely different from the previous version. What bait and switch or page swapping does is it first ranks a site by a niche and then changes the entire niche of the site with different contents. So the visitors while searching by keywords will eventually land on a page where nothing will be their similar to their search. How it hampers: If the Google crawler finds your website presenting different contents through page swapping, you are done for sure. The site will be penalized as per Google Guidelines. Google’s thoughts: Google won’t allow visitors being cheated. Page swapping makes visitors search for something and eventually land up in something else! Google will never allow quality errors in their search results. That’s why all the algorithms came in place. What it is: Creating a network of sources where a site’s URL will be linked up with low quality, irrelevant and lame contents. In Link Farming, all your backlinks will be from sources which do not provide any value to the audience. 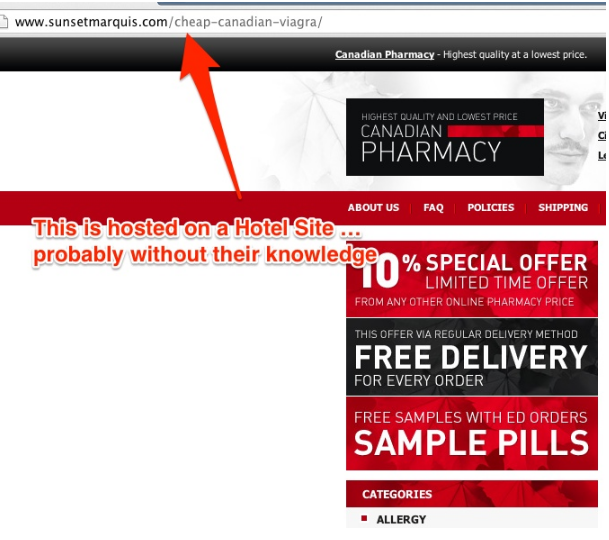 How it hampers: It’s a serious violation of Googles link scheme. If tracked Google can penalize a site by pushing back to the search result, de-indexing or even ban the main domain. Google’s thoughts: Google took a major action against one of the largest retailers in the world JCPenny! This Dallas based business was caught in link farming and the story was brought to Matt Cutts by the New York Times. What it is: It’s simply about copying trademarks. It’s one of those black hat SEO techniques which is used by black hatters to absorb the profit from the goodwill or brand name of someone. In other words, it means buying a domain name that matches with an existing, popular and branded entity with the intention of getting benefits from that brand’s name. How it hampers: It can kill you for Good. It’s like superman overdosed with kryptonite! You can see a booming growth of your site due to the already existing goodwill of your domain name but as you copied it you are always in the receiving end. You can be sure by Anticybersquatting Consumer Protection Act (ACPA) & also under Internet Corporation of Assigned Names and Numbers (ICANN). Last but not the least, Google is also there to lay the final nail in the coffin. Google’s thoughts: Google does not play a decisive role here. The main authority to deal with this is the ICANN. What it is: similar to cybersquatting, this is an attempt of copying competitors or popular brand’s names URL and intentionally misspelling it while creating your new domain. For example, if you buy a domain “Facebooq” that’s a kind of a Typosquatting. How it hampers: You immediately loose trust! People who are deceived to your site because of your misspelled domain name finds out they are in the wrong place. You can say them good bye forever! This also does not allow you to have a good impression on search engines. You may find your pages and new contents are not being indexed quickly. You may find your domain authority not increasing either. What it is: In simple words, advertising something to the users on the social network with messages, videos or comments which they did not ask for. Another characteristic of it is it could be deceptive, a lie and full of negative elements that’re anti-social. This is considered as one of the black hat SEO techniques for SMM as its completely valueless to the users. How it hampers: Ruins your reputation on the most important places for your business. People starts to get annoyed, don’t believe you and simply creates a distance. Moreover, you get reported now and then and lose your profile value. Authorities like Facebook, Twitter and LinkedIn take spam reports very seriously. Doesn’t matter who you are, if you are a spammer and annoying the users for your personal gain you are screwed. What it is: When a visitor visits a website, the visitor’s browser is poured by third party cookies which is from an entirely different website. This is done without the awareness of the visitor. As a result, if the visitor visits the website for which the cookies had been placed and converts, the cookie-placer gets paid! This is one of the most popular black hat SEO techniques that is used by affiliate marketing spammers! Though lot of affiliate marketing networks do not encourage this as there is no encouragement to the visitor for the entire process. 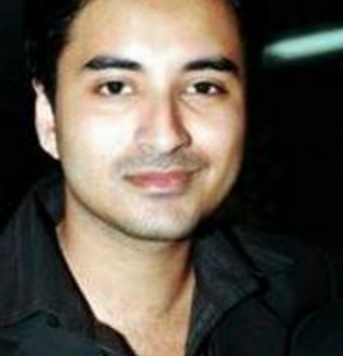 How it hampers: Top-ranked affiliate marketers almost made it to jail because of it. There was a news on marketingland where Matt Macgee wrote on how cookie stuffing could land eBay’s top affiliates in jail! Google’s thoughts: Google is yet to set any specific rule for cookie stuffing. But major affiliate networks do ban affiliates who do this. What it is: This is done simply by using bots or software’s that automates your tasks on major social networks. This is not one of those black hat SEO techniques that get your site penalized by Google. But if it’s abused and overused, that jeopardizes your brand’s reputation for sure. How it hampers: Black ships are there in every community. Black hatters just can’t resist the lust of spamming and manipulating. Hence, the automation tools which were made for time efficiency were abused to death! For example, tools which allowed auto follow/unfollow options were used to increase numbers robotically. People stopped checking who they are following or unfollowing! Rather, they just kept using these tools to boost their follower count to appear influencing online! Eventually, twitter killed some great tools like twitfox, and restricted amazing functions of tweepi. Moreover, excess automation makes the engagement looks robotic and decreases the quality of content. Hence, it is considered as one of the black hat SEO techniques that have been used on a social network. Google’s thoughts: Google has some guidelines which are closely related to automated tasks on social media. Here is a video which explains it well. What it is: Its one of those black hat SEO techniques which allows the black hatter to gain unfair link juice. A black hatter would host a wiki, forum or blog on a completely different server or website with high page rank! The host would not know about it and the black hatter will reap the benefits of the host’s high-quality domain. The contents hosted by the black hatters may carry other links which they want to rank high through this technique. What it is: It’s one of the black hat SEO techniques by which a site can be ranked on top by irrelevant and off topic keywords. For example, you got a site of beverages and it can be found on top of the search engine by keywords related to snacks! How it hampers: Let me give you just one example here. Just check the incident where Matt Cutts explained a penalty taken against Doc Sheldon’s Blog on inbound.org. If you are doing link building using Google Bombing technique, your days are in counting numbers. Soon, you will find yourself penalized and out of the online world. My thoughts: Well, it densest matter really what i think or Google thinks! What matters is what you think you should do? You are a startup and you need exposure, attention, and growth fast! But unethical approach can never get you what you want. Black hat SEO techniques are result driven. You can see your site rank top with traffic flooded. But in the end, you will be caught and everything you earned after working so hard will be banished. Wow, excellent post! Everyone who wants to be a successful and respected SEO specialist must avoid these techniques. Superb! Amazing post of black hat technique for every SEOs.